Rising lightweight prospect Ladaruis ‘Memphis’ Miller returns to the ring this Friday at the Sam’s Town Hotel in Las Vegas where takes on Dennis Galarza in a ten round bout. Miller is riding off a seven fight win streak after his only blemish back in February of 2016. Boxinginsider recently caught up with the young fighter from Memphis as looks to get closer to title contention with an impressive win over Dennis Galarza this Friday. Miller also talks about his desire to become a world champion, how boxing came into his life, and how his lone defeat actually made him a better fighter. “Boxing got into my life after my dad,” Miller said. “He took me to the gym when I was 10. It started with my dad. We were always playing sports at a young age me and my brothers. “It was the way we were brought up in a tough city, in a tough neighborhood and my dad just wanted an activity for us to do to try to keep us out the streets. “One day were watching an espn classic boxing fight and my pops decided to look for a gym for my older brother and I wanted to tag along. It started there and we went to the gym and I haven’t looked back since,” Miller said. From there Miller complied a solid amateur record of (87-17) and eventually turning pro in 2014. Miller is now (16-1) with 5 KOs as he looks to extend his winning streak to 8 consecutive victories this Friday. The 25-year-old is a southpaw who considers himself to be a pure boxer but doesn’t shy away from a fight if necessary. 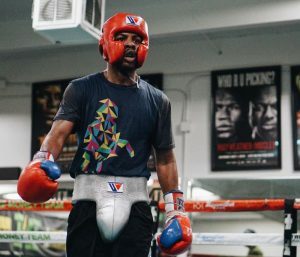 “Growing up I always watched the guys like Floyd Mayweather, Pernell Whitaker, James Toney, Roy Jones, Hector Camacho, Marvin Hagler, Tommy Hearns, and Sugar Ray Leonard,” Miller told me. Now 4 years into his professional career, Miller feels the Dennis Galarza fight is coming at the perfect time. He’s happy with how his career has progressed thus far and is well aware that an impressive win this Friday will present bigger opportunities in the near future. “I’m on pace to do exactly what I want to do. I’m living in the moment and trying to take advantage of every opportunity in my career,” Miller said. Miller is now currently signed to Mayweather Promotions and has been with them since the beginning of his career. He first crossed paths with Floyd Mayweather while still a young amateur. It was in the doghouse that Miller got the attention of Floyd by being able to hold his own with a number of professional fighters. “He (Floyd) liked my attitude and my personality and the way I fought. He got me an opportunity; he saw something in me to give me an opportunity to turn professional. It all started in the gym by making a name for myself and being a young amateur that could hold my own with a lot of professional fighters,” Miller told me. Miller also talked about his lone defeat which occurred over two years ago against Rolando Chinea. The 25-year-old insist that he wasn’t at his very best that night, but that the loss only made him a hungrier and better fighter. “I beat myself. That guy wasn’t better than me, but it was situation where I thought I had everything under control. That was a humbling situation for me. I always say that I loss that fight on the record, but it motivated me and it put me in a different mindset. “I don’t overlook anybody now. I take every fight like it’s a title fight now. It was just a situation where I was a young fighter who overlooked his opponent. I didn’t show up that fight, I wasn’t focused,” Miller told me. Miller expects a great fight with Galarza in a high stakes bout. He doesn’t even want to think about what’s next and what potential big fight is out there for him. He’s completely focused on the task at hand as he knows a win this Friday will only get him closer to getting a world title shot. “He’s (Dennis Galarza) the most important thing in my career right now, it’s this fight on August 3,” Miller said. “At the end of the day I know what can happen for me once I beat him, but at the same time I got to remain focus. “I know what a win could lead to and I know what a loss could lead to. It’s going to be an exciting fight and I know he’s coming to fight. It’s once step closer to my goal in becoming a world champion. Once I beat this guy, I’m a step closer to getting a title shot. My main focus is on the fight,” he said.